From an article on the Sky and Telescope website by Monica Young, originally posted on December 10, 2015. Santerne and colleagues followed up on Kepler’s long list of planet candidates during a five-year observing campaign. Between July 2010 and July 2015, the team spent 370 nights observing 129 planet candidates out of more than 4,000 that were identified by Kepler, and only 45 of these turned out to be bona fide planets. The rest fell into 3 different categories: 3 were brown dwarfs, 63 were multiple-star systems, and 18 were neither of these, but could not be confirmed as planets. Even if all of those 18 cases turned out to be planets, 51% of Kepler’s giant potential planets would still turn out not to be real. Previous studies found a much lower ‘false-positive’ rate for Kepler’s planet candidates. However, according to experts on Kepler data, this seemingly surprising high false-positive rate is not surprising at all. For more information on our Solar System, and others, see Chapter 9 of The Cosmos. Link to the original article here. This new graph plots orbital period versus planetary radius for planetary candidates discovered by the Kepler Space Telescope (see also The Cosmos, Section 9.2d, pp. 240-243, and Figure 9-9, p. 239). The colored symbols represent how many planets orbit a given star, and the legend lists how many of this type of system are in the catalog. (For example, the catalog lists 2967 stars with only one planet orbiting them.) Planets with shorter orbital periods are overrepresented because geometric factors and frequent transits make them easier for Kepler to detect. The upward slope in the lower envelope of these points is caused by the difficulty in detecting small planets with long orbital periods, for which transits are shallow and few are observed. Link: article in EOS; for more detailed information, see Lissauer, J. J., R. I. Dawson, and S. Tremaine (2014), Advances in exoplanet science from Kepler, Nature, 513, 336–344 (arXiv version available here). Debra Fischer is an astrophysicist at Yale University who has discovered hundreds of exoplanets, and she was the first to discover a system with several exoplanets around one star. On September 30, American Scientist met up with Dr. Fischer for a Google Hangout to discuss the methods used to find exoplanets, how much we can currently decipher about these planets’ properties, and what new information some planned ground and space-based observatories might be able to contribute. She also tackled the all-important question of whether we might find exoplanets that support life. This event marked the first in a series of Google Hangouts with all of Sigma Xi’s Distinguished Lecturers, one of whom is Dr. Fischer. Dr. Fischer also helps to run a citizen science project called Planet Hunters, which aims to classify readings and find exoplanets with the public’s help. For an in-depth discussion on exoplanets and how they are discovered, see Section 9.2, p. 236-244 in The Cosmos. Astronomers using the HARPS planet-hunting machine at ESO’s La Silla Observatory in Chile have made the first-ever spectroscopic detection of visible light reflected off an exoplanet. These observations also revealed new properties of this famous object, the first exoplanet ever discovered around a normal star: 51 Pegasi b. The result promises an exciting future for this technique, particularly with the advent of next generation instruments and future telescopes, such as the E-ELT. The exoplanet 51 Pegasi b lies some 50 light-years from Earth in the constellation of Pegasus. It was discovered in 1995 and will forever be remembered as the first confirmed exoplanet to be found orbiting an ordinary star like the Sun. It is also regarded as the archetypal ‘hot Jupiter’ — a class of planets now known to be relatively commonplace, similar in size and mass to Jupiter, but which orbit much closer to their parent stars. Currently, the most widely used method to examine an exoplanet’s atmosphere is to observe the host star’s spectrum as it is filtered through the planet’s atmosphere during transit – a technique known as transmission spectroscopy. An alternative approach is to observe the system when the star passes in front of the planet, which primarily provides information about the exoplanet’s temperature. The new technique does not depend on finding a planetary transit, and so can potentially be used to study many more exoplanets. It allows the planetary reflected light spectrum to be directly detected in visible light, which means that different characteristics of the planet that are inaccessible to other techniques can be inferred. The host star’s spectrum is used as a template to guide a search for a similar signature of light that is expected to be reflected off the planet as it describes its orbit. This is an exceedingly difficult task as planets are incredibly dim in comparison to their dazzling parent stars. The signal from the planet is also easily swamped by other tiny effects and sources of noise. In the face of such adversity, the success of the technique when applied to the HARPS data collected on 51 Pegasi b provides an extremely valuable proof of concept. Is Earth the only known world that can support life? In an effort to find life-habitable worlds outside our Solar System, stars similar to our Sun are being monitored for slight light decreases that indicate eclipsing, or transiting, planets (see section 9.2d, pp. 240-243). Many previously-unknown planets are being found, including over 700 worlds recently uncovered by NASA’s Kepler satellite. Depicted above in artist’s illustrations are twelve extrasolar planets that orbit in the habitable zones of their parent stars. These exoplanets have the right temperature for water to be a liquid on their surfaces, and so water-based life on Earth might be able to survive on them. Although technology cannot yet detect resident life, finding habitable exoplanets is a step that helps humanity to better understand its place in the cosmos. Links: APOD for full-size image; Kepler mission website. A space-based observatory to search for planets orbiting alien stars has been selected as ESA’s third medium-class science mission. It is planned for launch by 2024. PLATO will monitor relatively nearby stars, searching for tiny, regular dips in brightness as their planets transit in front of them, temporarily blocking out a small fraction of the starlight. By using 34 separate small telescopes and cameras, PLATO will search for planets around up to a million stars spread over half of the sky. It will also investigate seismic activity in the stars, enabling a precise characterization of the host sun of each planet discovered, including its mass, radius and age. When coupled with ground-based radial velocity observations, PLATO’s measurements will allow a planet’s mass and radius to be calculated, and therefore its density, providing an indication of its composition. 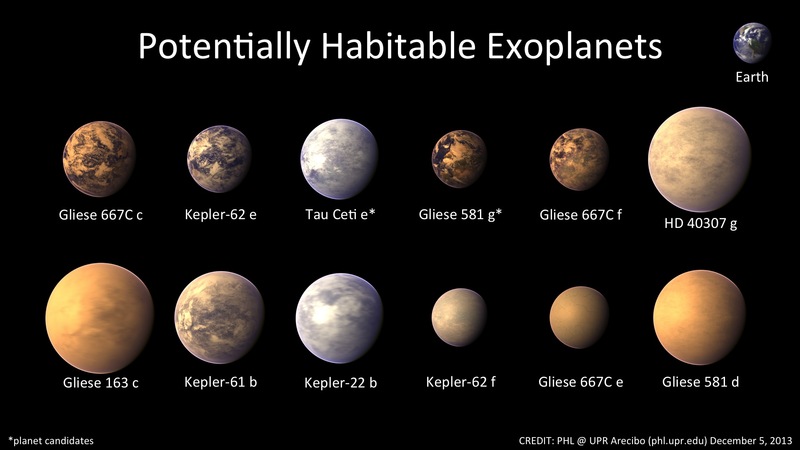 The mission will identify and study thousands of exoplanetary systems, with an emphasis on discovering and characterizing Earth-size planets and super-Earths in the habitable zone of their parent stars – the distance from the star where liquid water could exist on the surface. Data from ESA’s recently launched Gaia mission will help PLATO to provide precise characteristics of thousands of exoplanet systems. These systems will provide natural targets for detailed follow-up observations by future large ground- and space-based observatories. A new annotated guide to written, web, and audio-visual resources for teaching and learning about planets orbiting other stars has been released. Materials in the guide to this rapidly-changing branch of astronomy include video and audio files of lectures and interviews with leading scientists in the field, phone and tablet apps, a citizen-science web site, popular-level books and articles, and more. Astronomers have used data from the Spitzer Space Telescope to measure the distances, and hence temperatures, of so-called “brown dwarfs” (see Section 9.5). These brown dwarfs, the coldest known free-floating celestial bodies, were found to be warmer than previously thought, with surface temperatures ranging from about 250 to 350 degrees Fahrenheit (125 to 175 degrees Celsius). By comparison, the Sun has a surface temperature of about 10,000 degrees Fahrenheit (around 6000 degrees Celsius). To reach these surface temperatures after cooling for billions of years, these objects would have to have masses of only 5 to 20 times that of Jupiter. Unlike the Sun, the only source of energy for these coldest of brown dwarfs is from their gravitational contraction, which depends directly on their mass. The Sun is powered by the conversion of hydrogen to helium; these brown dwarfs are not hot enough for this type of “nuclear burning” to occur. The findings help researchers understand how planets and stars form, but also present new puzzles to astronomers who study cool, planet-like atmospheres, as the observable properties don’t correlate with temperature in a straight-forward way. Ongoing studies of newly discovered brown dwarfs may shed some light (and heat) on these outstanding issues. Read the JPL press release for more detail and additional images.